When Jon started his side business, he started looking into more ways to make his process more friendly not only to the environment, but also to the health of his clients (and their neighbors, guests, patients, etc.). He often painted for couples that were expecting a child, or who were worried about fumes irritating their asthma, or cancer survivors & fighters that knew of the harmful effects of the VOC’s in regular paint. So, we both started learning everything we could about these harmful chemicals, and how to select products that had NO or LOW VOC’s (and even some non-toxic paints) that could still do a professional job and not look or cover like cheap paint from a home center. We also learned about how to make his process of painting less harmful, such as sanding techniques, cleaning, recycling, safe disposal and the moral of today’s story: NO-VOC fabric wall covering! This technique takes fabric, and turns it into a gorgeous wall covering that looks just like wallpaper, only better! You can learn more about his business on his site at www.bluespheregreen.com! You can see where Jon has started the wallcovering process. 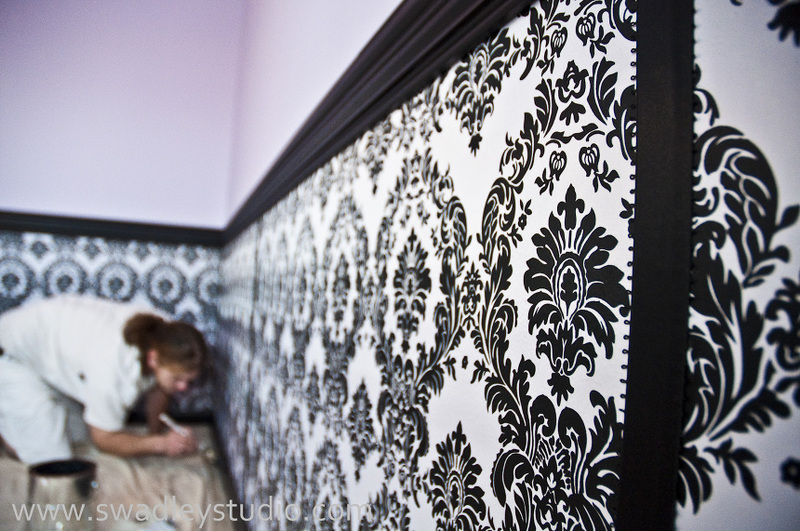 It is a bit time-consuming, but I’m telling you… Satin damask fabric makes the most beautiful wallpaper ever! Plus, have you ever taken wallpaper down? NIGHTMARE, right?!? Well, this process makes it ridiculously simple to remove.. and leaves NO torn drywall or discoloring glue stuck to the walls! When you are ready to remove it, you just pull it off. That’s it. No kidding, no exaggeration (I’ll post a video one day to prove it on Jon’s site). 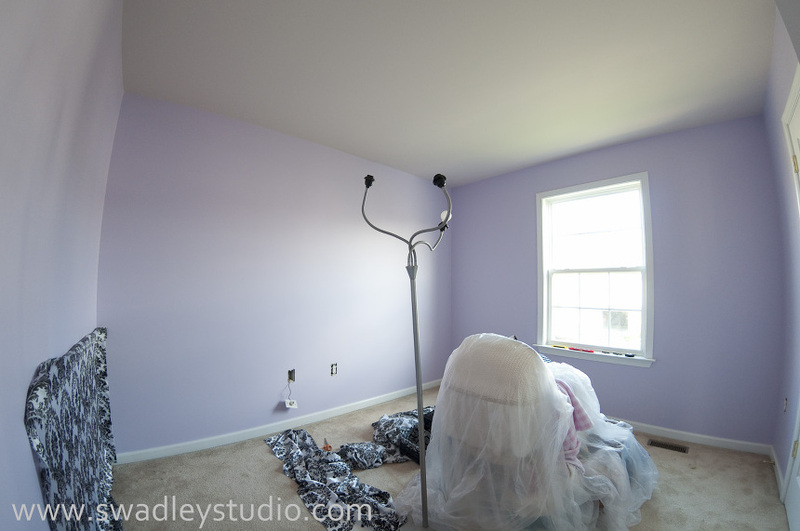 A few details, including: a purple tutu (what little girl’s room isn’t complete without a tutu? ), her lantern above her book nook that she picked out herself at Ross, her favorite pillow, her “pretty box” with miscellaneous nursery supplies that is now used as her stepping stool into her bed, the two damask recycled bags that we use as her dirty clothes bag and clean cloth diaper inserts bag, and my favorite thing… the little purple book that I use to write her love notes every now and then. And we’ll end it with the book she read to me yesterday morning Yes, she really does sit like that with her legs crossed, lol. What a sweet pea!!! The amazing thing about this nursery, is since we used mostly items that we had already & my dad purchased the crib, we ended up spending a total of less than what it would have cost for just a crib bedding set! 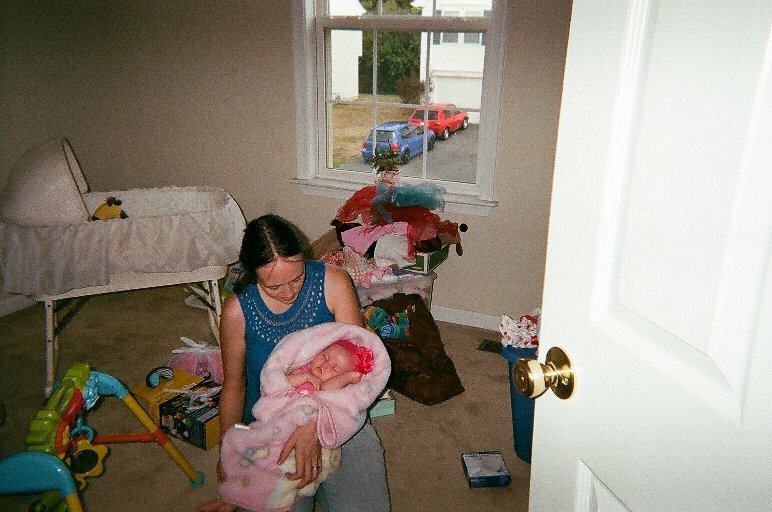 I couldn’t find the perfect bedding set that we could afford that matched the room, so we used a purple blanket that we had as a mattress cover, and used the money we saved on the bedding set for all the accessories and the fabric for the walls. The most expensive item we purchased was the custom-made window valance which was still super-affordable on Etsy (LOVE Etsy!). Even that changing table/dresser is an old broken dresser my brother had in storage that we painted, and switched out the broken top drawer for the cute damask fabric-covered baskets to hold her diapers/wipes/lotion. We are very happy with what we could do with what we already had. Now, it’s time to plan our upcoming little boy’s nursery! Yahoo!!! Thank you so much, Jon, for being amazing at what you do! « Mother’s Day Special ~ Best Deal Ever! Beautiful Nursery!! Absolutely lovely. Where did you get the satin wall paper/cover? And, with what products do you install it? What’s the color of the wall?